Numbers given are as-built, renumberings are discussed in the section on each specific car type. All but two B&M cabooses during this period had two 4-wheel trucks, and none had bay windows. The definitive reference to date is Tim Gilbert's B&M Cabooses - A History of Development & Use 1914 - 1955 (B&W, Salisbury Point Railroad Historical Society 1999). This book contains diagrams, photos and a complete roster, including the ex-L & NE cars. Steel center-cupola, ribbed sides, 2 high-set windows/side, similar to NYNH&H NE-5. 33' steel body, cupola slightly off-center on old underframe & trucks from 4600-series SUF cabooses. steel transfer caboose , ribbed roof, no cupola. Wood 40' off-center cupola, , many rebuilt w/SUF. Wood combines used as cabooses without much rebuilding, 103502 (ex 2049) at Strasburg, PA. Prior to 1956, as a rule B&M buggies were painted black on the roofs and underbodies, boxcar red on the body and cupola sides, and a brighter red (which aged to something like caboose red) on the ends of the body and cupola. Lettering and the herald could be any mixture of white, yellow or imitation gold. Before the Minuteman herald was introduced in 1946 the road name or initials appeared on the side. After about 1950, handrails started to be painted yellow. 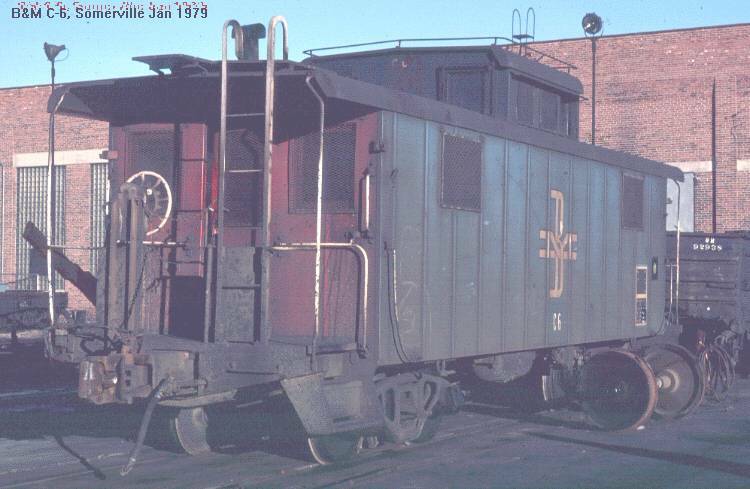 The caboose version of the McGinnis paint scheme was blue on the sides, with a wide black horizontal stripe at about window level, and roof, cupola, ends and underbody also black. A large interlaced BM herald in white was applied on the sides. This was applied to the 1959 International rebuilds, the International transfer cabooses, and the wood/SUF cars bought from the Lehigh & New England. None of the other wood cars and few of the N-5 and NE-5 steel cars received this scheme. By the late 1960s, the older steel cars had all been painted blue, but the black stripe on the side was omitted, and the herald was an intertwined BM in white only. In shoppings after about 1972, the red ends re-appeared, with a black outline around the BM herald. The cupola ends remained black. When the International rebuilds went through the shops in 1975, all received this scheme. Few of the N-5 and NE-5 cars received this version quickly - into the late 1970s their solid blue sides just got dirtier and dirtier. B&M cabooses that survived into the Guilford era were renumbered into the 400 series about 1984. In most cases the 'C' was simply replaced with a '4' but this wasn't universal. From the 19th century to about 1984, all B&M road freights, and locals operating outside yard limits used cabooses. The 'rear-end crew', usually the conductor and rear brakeman normally rode in them, and the conductor used the desk for paperwork. Coal stoves for heating were replaced with kerosene or oil units in the 1960s. A 'dry hopper' toilet completed the equipment. I'm not aware of any B&M cabooses receiving retention toilets, before or after the sale to Guilford. Most cabooses were equipped with bunks and storage lockers, but by the time the 1959 International rebuilds and 1960 transfer cabooses (C-150 to C-169) the sleeping accomodations were limited. Most B&M 'away' terminals had railroad YMCAs, hotels etc. so crew with assignments that required rest rarely took it in the caboose. Sean McInernery: The transfer buggies built in late 1960 were set up for kerosene from the start. Marker lamp brackets were mounted on the outside of the corner sheets. The same brackets were also mounted on the wall of the first locker on the A end. This was for safe storage of the lamps. The inside shipped with two Adlake lamps. One on the wall next to the sink and the other in the head. An Aladdin caboose lamp was mounted on the side wall above the conductors desk. No electric interior lighting was ever added. Some got a light box welded to the tail of the roof below the walkway. The battery was installed in the storage bunk on the A end. Others just used a single Star lamp on the marker bracket. It was an orange or yellow plastic lamp that held two 6V lantern cells with a swivel light on top. Usually a yellow lens. The sleeping accommodations on the international transfer buggies were the same as that found in the Laconia rebuilds. Two steel storage bunks with a 3-4 inch vinyl mattress pad on top. The last 3 B&M buggies were all transfers. 493(C163), 491(C161) & 494(C164) were in service until June 2003. All three were sold at the same time with Fast Track Railroad Sales acting as the agent. By day: marker lamps, lighted or unlit. must show read to rear. The 'built-in electric markers' appeared first on the 1947 P-S lightweight coaches and contemporary lightweight equipment from other railroads. All the RDC-1s, -2s and -3s had built-in markers with a rotating housing to change the color displayed. B&M caboose marker lamps continued to burn kerosene past 1966. They had the conventional three lenses on a body that could be rotated to show different colors per Rule 19. By 1970, caboose markers were battery powered: a yellow plastic box held a lantern-sized dry cell. A round red lens was attached to the top. A single battery lamp on one of the marker light brackets completed the train. By the end of caboose operations in the early 1980s, most surviving B&M cabooses had fixed yellow lamps mounted to the edge of the roof under the end of the running board. Most post-war B&M cabooses can either be modified from available plastic kits, or purchased as ready-to-run brass imports. Paint schemes changed with the era, and it is worthwhile to have a dated color photo of a specific car in hand if you want to be exact. The N-5s were built as 104700 - 104724 in 1932. 104707 was wrecked in 1936, and the remaining cars were renumbered to C-11 through C-34 in 1942. Some survived to the end of the caboose era under Guilford. They were initially assigned to the Fitchburg division in order to allow the operation of helpers behind the caboose, and they continued to draw mostly through freight assignments for the remainder of their service lives. All were initially painted in the boxcar red/caboose red scheme, and the survivors eventually received the post-McGinnis blue scheme without the horizontal black stripe. A car is in use as an office at a landscape supply business on New Hampshire Route 125 near the Plaistow - Kingston line, and C-32 is on display at the Raymond, NH railroad station museum. HO scale brass models of B&M N-5s have been imported, but I am quite satisfied with my rebuild of a Bowser plastic PRR N-5. Whether or not you replace the cast-on handrails is a matter of taste, but you should remove the rectangular protrusion on one side, and the B&M didn't use the heavy collision posts applied by the PRR. A B&M-style handrail/brake/roof support could be fabricated from brass or styrene, but I used the detailing kit offered by Eastern Car Works. I didn't replace the PRR steps, just filed the inner side down to the point that the resemblance is reasonable. My trucks are Kadee, with Precision Scale Co. (I think) leaf springs. An article on re-detailing a Bowser kit appeared in the September 1995 Mainline Modeler . These cars were built at the Osgood Bradley (Pullman) plant in Worcester, MA. The design was borrowed from the New Haven (their class NE-5), except that the B&M only used two-tread steps. The B&M cars were delivered in boxcar red with caboose red ends, and received the post-McGinnis scheme in the early 1960s. Like the earlier N-5 clones, their all-steel construction suited them for main-line freight service, where helpers were often required. Plans of the New Haven cars appeared in the October 1997 Railroad Model Craftsman . Several operated into the Guilford era. One is preserved at the park located on the site of the Greenfield, MA passenger station. A number are in private hands. In 2008, Intermountain introduced an HO scale plastic model of these cars, decorated for both B&M and NH. Alco and Overland have both imported brass NE-5 cabooses. Alco's catalog number X-123 is the 2-step version which is right for the B&M's cars and the second batch of NH cars. OMI-1199 was advertised as a B&M version, but I haven't examined one. The major challenge in scratchbuilding or kitbashing one would be the vertical ribs on the sides. This could be addressed with thin strip styrene or brass. The Barber "Swing Motion" trucks aren't a problem. The overall dimensions are quite close to the NH NE-6, which has been issued in HO plastic by Atlas. In January 2015, Eastern Seaboard Models announced they were working on an N scale kit. Through 1975, these cars ran on the steel bar-frame drop-equalized 6-foot wheelbase journal bearing trucks they inherited from the 4600-series wood/SUF cars. They were delivered in the McGinnis blue/black/white scheme with the large BM herald. They were commonly used in local and short-distance service. C-116 was wrecked 11/1972. In 1975, the rest were rebuilt and renumbered into the C-51 through C-87 series. In the process, they received the blue/black/red scheme with the smaller black-outlined herald. New snubber-equipped roller bearing Bettendorf trucks were applied, but the age of the underframes kept the cars out of interchange service. An article with a good plan appeared in the Winter 1977-78 B&M Bulletin . Brass models of these cars have been imported in HO: Overland 3898 and 3899 were done before 2000. Railworks R-512 dates to 2004. One example of OMI 3899 (as delivered by International) had axles loose enough so the wheels could short against the sideframes. Reboxx 0.995-length wheelsets solve the problem, provided their .088 width gets along well with your track. You can also do a recognizable kitbash beginning with the old Model Die Casting HO plastic center-cupola steel caboose. The windows need to be re-shaped with styrene fillers and filing. The only major issue is that the trucks for the pre-1975 cars may need to be scratchbuilt, or obtained from one of the brass imports. A limited run N-scale kit has been available at times. These cars spent their lives in local and transfer service around Boston and other major B&M terminals. Spartan interiors and lack of cupolas limited their use in road service. As local traffic dwindled in the 1970s, I saw less and less of them, and many were disposed of before Guilford. At least one survived into 2004 as a vandalized shell used as a "backing car" in local service around Boston. Crown Custom Imports imported an HO version as #CCI-237 circa 2009. A kitbash of the International transfer cabooses was written up in Modeler's Notes #3 . The author started with an Athearn bay window car and shortened it. An alternative is to find one of the resin kits of the LIRR N-22 class cabooses and detail it for the B&M. This involves filling a window, but not much else. These four cars were built on the shortened frames and trucks of 1600-series milk cars, but had truss rods as well as a steel underframe. Design resembled a wide-cupola 104000-series car, but the cupola was centered. 103002 remained in service into 1964, and is now at Seashore Trolley Museum in Kennebunk, ME (and for sale, I believe). Cars orginally assigned to the 104000 series were built over a span of decades, and at different locations. Purpose-built cars in this series were 42' over the pulling faces, and about 34' over the body. Others were rebuilds from pre-1880 passenger cars, and differed in length and window configuration. This is one case where a class of cars actually got less diverse over time - by 1940, the survivors had steel underframes, and two basic styles of cupola, and two body plans predominated: Some had been rebuilt with a wide cupola, others retained the unique long narrow cupola that looks like it came off a yacht (5 windows in pre-1902 cars, 4 windows in newer cars). The original body style had five windows on the side, the wide cupola rebuilds had four. A plan of the five-window narrow cupola variant appeared in the March 1973 B&M Bulletin . A plan of the four-window narrow cupola variant appeared in the July 1988 Model Railroader . As far as I know, all these cars ended their service lives in the black/boxcar red/caboose red scheme. The last two five-window narrow cupola cars (one built in 1893) were retired in January 1961 and the last two four-window cars (one with narrow cupola, one with wide) were retired in 1964. A preserved wide-cupola car (10482) is at Clark's Trading Post, Lincoln, NH. A narrow-cupola car (104331) went to Steamtown by way of the St. Johnsbury & Lake Champlain (51), and another (104391, later Belfast & Moosehead Lake 27) is in North Conway, NH, but the monitor is not original. 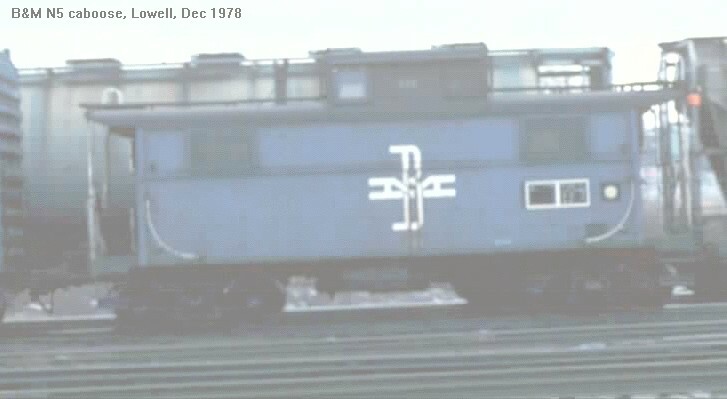 New England Rail Service imported brass models of both wide and narrow cupola versions of this caboose in 1982. Another importer offered similar cars around this time, which I'm told are QA rejects originally made for NERS. The Railworks version imported in 2002 was nicely done, even to being available with both 8' and 6' wheelbase trucks. However, the lettering on my factory-painted car is a little oversize. Scratchbuilding is a viable alternative, assuming you can find a reasonable truck; I've heard the MDC/Roundhouse #480-2936, "wood beam passenger trucks" recommended. The Train and Trooper hobby shop in Maine has offered a resin kit of both wide and narrow cupola cars, and I have also heard rumors of a laser-cut wood kit to be manufactured by American Model Builders. A plan appeared in the April 1960 Model Railroader , and was reprinted in the Winter 1977-78 B&M Bulletin . The Bulletin article also includes a complete roster with dispositions. The cupola was a little narrower than the carbody, and there were footboards along the edges of the roof beside the cupola. The roofs were covered with canvas. Per Gilbert, these cars were built in the series 104600 - 104649. They were originally painted boxcar red/caboose red and remained in this number series until scrapped or rebuilt by International Car in 1959. 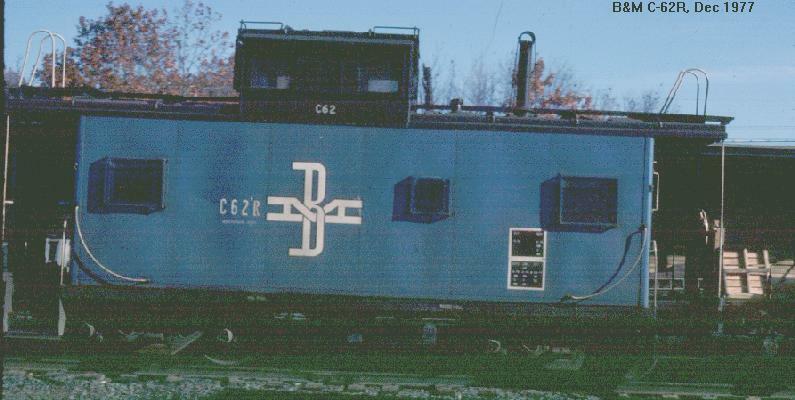 Number 104610 is on display at White River Jct., VT, but take care - the lettering wasn't historically accurate, at least when photographed for the article in 1980. A couple of other bodies were sold as camps in Ohio during the rebuilding, and are preserved. HO Brass models were imported by PFM in 1978, and by Overland in 1986: OMI 1213 had the original width straight side cupola, 1216 had a modified full-width slant side cupola, 1217 had a vertical brake staff. The latter can still be found at dealers occasionally - they were nicely done, but take some attention to the trucks to give them enough swing to actually operate. Scratchbuilding one from wood or styrene would be no harder than any other caboose (but a good deal harder than a boxcar, due to the cupola and windows). The trucks have only been imported in brass, though. Per Don Valentine, these cars were originally built with vertical cupola sides that were set a few inches in from the car sides, leaving room for a narrow footboard along the edge of the roof. By 1930, the following cars had been re-built with sloping cupola sides that came out to the edge of the roof, with no footboard: 104600 - 104603, 104605, 104612, 104635, 104638, 104640 - 104642 and 104645.